Oli and Flo are the couple behind Cook Eat Discover. Oli is an experienced chef and pasta maker and Flo is an events organiser from London. 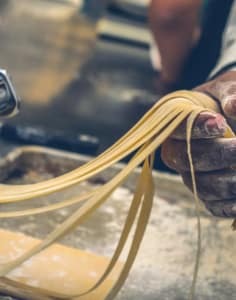 They have combined their skills to try to create immersive, behind the scenes cooking and food experiences and classes for those fascinated by Italian gastronomy. Growing up, Oli spent his summers the Italian Maremma region, and after a range of chef work in the UK, he went on to move to Tuscany to further develop his skills and passion for the region's culinary traditions. He has also trained as a 'sfoglino' or artisan pasta maker, and is excited to share his love for and knowledge of Italian food with you. The focus of Cook Eat Discover is very much on intimate and immersive cooking classes! Really enjoyed this class, would definitely recommend it. Oli is an amazing teacher, knows his stuff and gave everyone the time and attention that they needed. I can away with some handmade pasta and the confidence to be able to do it again myself. We had a really great time at the workshop. The team were very welcoming and informative throughout the whole evening. The class was really easy to follow and it was a lot of fun to make the pasta. The Italian snacks and wine were great too!